To begin this text effect, we must start with the most critical element—the text. Select the Type tool (T) in the Toolbox and click in the artboard to set a text object. Enter whatever text you like. We entered “WOW” in all caps using the font Gill Sans Ultra Bold. Once entered, scale the text as necessary. Just in case you want to go back and change the text later, drag the type layer in the Layers panel to the Create New Layer icon to duplicate the text object. Click the Eye icon next to the original text layer to hide it. Select the duplicated text with the Selection tool (V) and convert it to outlines by going under the Type menu and choosing Create Outlines. 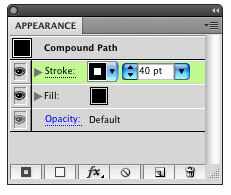 For the sake of visibility, set the Fill to white and the Stroke to black. Now we need to distort the individual letters. For this we’ll use the Free Transform tool, which can be a bit tricky. First, make sure all of the letters are ungrouped (Object>Ungroup) and select the first letter with the Selection tool. Switch to the Free Transform tool (E), and click-and-hold on the top-left corner of the transform box. Press-and-hold the Command key (PC: Ctrl key) and drag the corner to manipulate the shape of the letter. The Free Transform tool takes a little practice if you’ve never used it. Continue to do this to the remaining letters, varying the distortion and position of each. 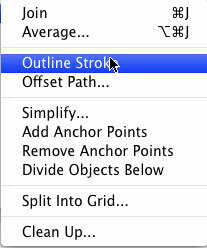 With these objects still selected, go into the Object menu to Path and choose Outline Stroke. This will expand the shape area out to the stroked area, making it a regular shape. Now we need to change the color of this shape. Open the Swatches panel and set the Fill color to blue and the Stroke color to red. 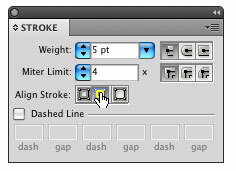 Open the Stroke panel from the Window menu. Set the Stroke weight relatively thick, depending on the size of your art—we used 5 pt in this example. Click the center icon next to Align Stroke to put the stroke on the inside of the shape. Now go and get the duplicated text that we distorted earlier and position it on top of the border shape. 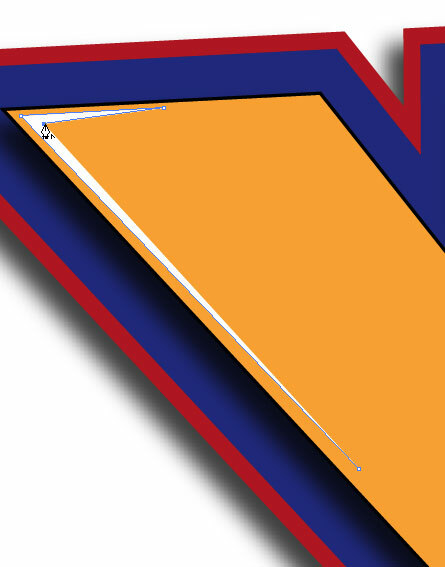 Change the Fill color to an orange and the Stroke to black. Don’t make the stroke too big; make it just enough to define the shape so the two shapes don’t appear to be combined (1 pt in this example). Select just the last letter. 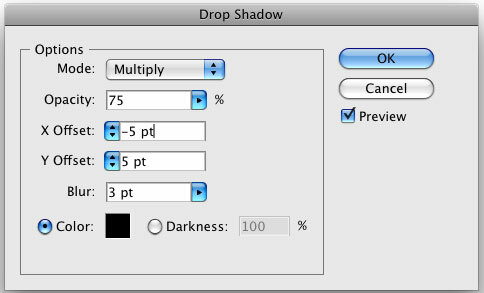 Go under the Effect menu to Stylize (under the Illustrator Effects listing) and choose Drop Shadow. Enter –5 pt in the X Offset so the shadow appears more to the left. Enter 5 pt for the Y Offset and enter a 3 pt Blur. (Note: These numbers will vary depending on the size of your art.) Click OK. Select each of the other letters individually and apply the same effect by choosing Apply Drop Shadow under the Effect menu. Apply it to the border shape behind the letters, as well. Now we’re going to apply some subtle highlights. Grab the Pen tool from the Toolbox. Set the Fill color to white and the Stroke color to none. 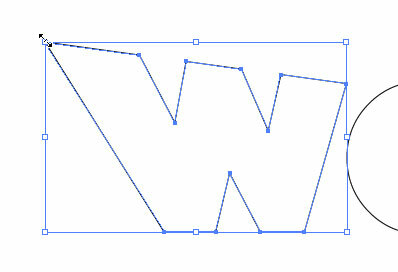 Then at various corners of the letters, draw some very small corner shapes to give the letters a little more interest. Continue this on all the letters but don’t get carried away—it’s easy to overwork something until it doesn’t look cool anymore. That pretty much does it. You can see the possibilities here and the many different directions you can go with this. Have fun! This is perfect! Simple, effective – Just what I needed to complete a down-n-dirty project that was given to me just before lunch. Got back to my desk after lunch, and saw this tutorial on my RSS feed. Exactly the effect I needed! Many thanks! Really cool effect! How did you do the dotted background? Can I make this background with CS3, if so, how? Really cool and easy tutorial!! Thanks. I ran into one problem at the end I was drawing the small highlights with the pen tool will fill set to white and stroke set to blank and nothing was showing up while I was drawing. Any advice? In response to Don: throughout the tutorial what needs to be done differently in CS3 is explained. Thanks for sharing your knowledge with us in this way you are getting an more friendly internet for all. josh, i had this problem too, found out I was on the wrong layer, it was drawing the shapes on the blue layer underneath. make sure you have that top layer selected, and the highlights should show up. GREAT Tutorial!! thanks! hello my name is leila davis this website saved my dad from gout thank you for for this help! for don: you select the highlight. then right click…click arrange and bring to front…so that the “highlight” will appear. Its amazing how simple this is! Cool, informative and original. Nice Tutorial to get started. Thank you.